Dreams and running have something in common — both require energy. Researchers have realized that the single most important thing that brings meaning to your life is the people you’re surrounded by. I am grateful for my family and friends, because of the positive impact they have on me all the time. Especially, the support and the understanding I got from them during my running adventures are priceless. Running has lots of advantages for a person’s health and life. But for me it hasn’t been so important, until I decided, at age of 38, that I want to run a marathon as a present for my 40th birthday. On Sunday, November 3, 2013 I was sitting in front of my parents TV, ready to watch the 2013 New York City Marathon. The previous year’s marathon was canceled due to Hurricane Sandy. And following the 2013 Boston Marathon bombings, this year’s race were particularly special to be witnessed. A record high of fifty thousand people finished the marathon, which was the largest number of participants of any marathon in history. It was so tremendous, that I instantly got this thought “I want to participate in this race!”. It really moved me! Funny thing is how you can’t will things to happen, no matter how much you wish. Because often, there’s a better and “righter” path, that reveals itself if you keep your eyes and mind open. I’ve applied for a ballot place 4 years with no luck. And when I was watching how Shalane Flanagan won the race last year, I wasn’t even sure if I should apply again for the 2018 TCS NYC Marathon, as I was suffering from another herniated disc for 9 months. But I’m a finisher. I have this dream and I decided to keep trying. Just this time, instead of relying on willpower, I set myself up for success. I began with the training for the 2018 TCS NYC Marathon two months before knowing the ballot results. I just pretended I’m in, and set my focus on getting better and pain free. The feeling to be on my way in a direction that isn’t driven by money and power, but by freedom and fulfillment, is exceptional. Being honest with myself about my limitations, and what I can do to get around them, is a simple, yet very efficient tool. It is the spoon I used to feed my dream. Day after day, I scooped up exercises, long walks, chiropractor sessions, massages. Big dreams take a long time to come true. Five years ago I didn’t deserve to run the streets of New York City. All the ups and downs, the months of training… you simply can’t become anything overnight. Truth is, I’ve probably learned more about life in these last five years than at any other time. Big dreams also require experience. And they demand so much failure along the way, because the truth is going to test you. Sometimes, the secret to unlocking our greatest potential is inside of messing up. I finished three marathons from April 2015 to October 2016 and I am more confident now in how to make a mistake, to find the lesson and to move on. 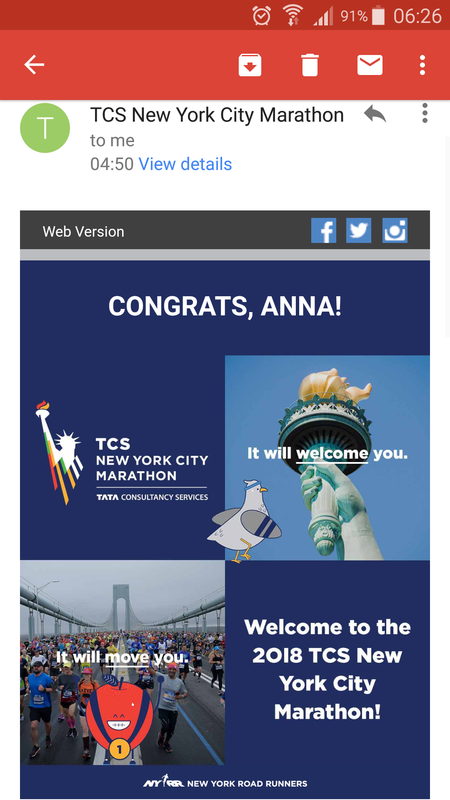 If I knew getting a ballot place to the TCS NYC Marathon was going to take five years— would I still want it? Yes! It really moved me to be better and stronger. Running the race on Sunday, November 4, is neither the beginning nor the end of my journey. It is another mountain I wanted to explore. And I am beyond grateful and happy to be able to do it next Sunday. Dreams and running have something in common — both require energy. You can’t run a marathon without a proper eating routine, and you can’t see a dream come true without feeding it well. So, here’s how to feed a dream. Any dream. Work for it with all the discipline, persistence and patience you are capable of.